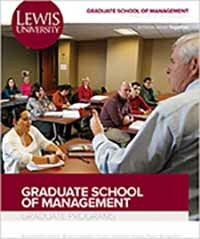 More than just a business education, Lewis' Graduate School of Management offers an environment where you will face real-world challenges in classrooms with your peers and faculty who are experts in their fields. E-mail us or fax your transcript to our Director of Admissions at (815) 838-3330 to determine what foundation courses might be waived based on your previous undergraduate business coursework. Have any questions? Please contact our Director of Admissions, Michele Ryan at ryanml@lewisu.edu or (815) 836-5384.